Prototype: Swiss Federal Railways SBB, Cargo business area, class Re 482 electric locomotive 1st production series. Version of the first production series with 4 pantographs. Model: The locomotive has an mfx digital decoder and extensive sound functions. 4 axles powered through cardan shafts. Traction tires. The triple headlights and dual red marker lights will work in conventional operation, and can be controlled digitally. Maintenance-free, warm white are used for the lighting. The locomotive has 4 mechanically working pantographs that are not wired to take power. Length over the buffers 21.7 cm / 8-1/2". 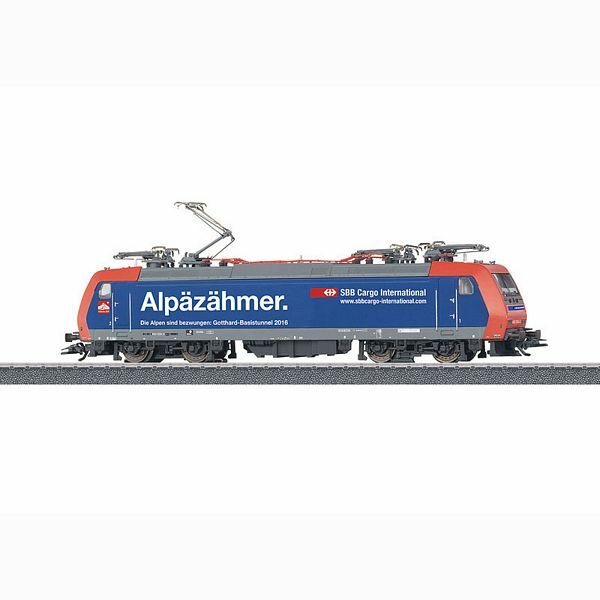 Advertising locomotive "Alpazahmer" for the new Gotthard Base Tunnel.